It’s been a long and windy road, but we’ve stayed true to our principles: delicious foods cooked in primitive ways, a commitment to flavor and to service, being honest and doing good. Marshall Odeen is the legendary driving force behind Odeen’s Barbecue. 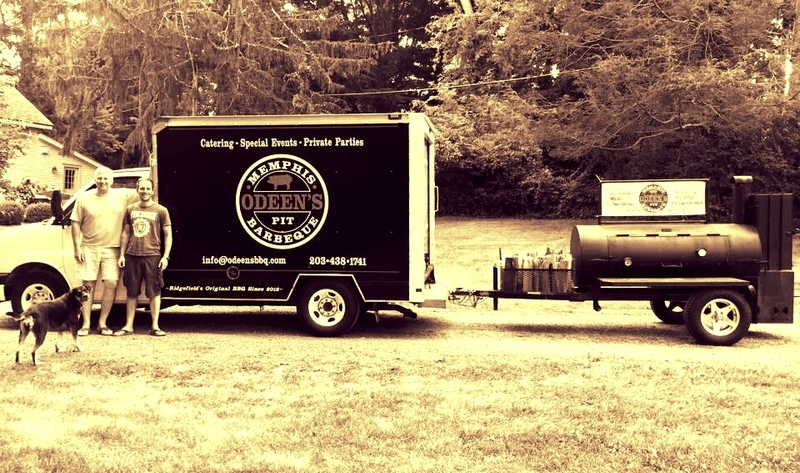 Born and raised in Nashville Tennessee, he founded Odeen’s BBQ in 2012 with an aim to extending Southern hospitality and authentic open fire cooking to a neglected New England audience. He’s the principle contact for all wedding inquiries as his attention to detail and can do attitude will make you glad he’s on your side. His neighbor and friend John Lloyd joined Marshall in the very early days and helps shape the commitment to making amazing foods and memorable events. A true world citizen who has lived, worked and traveled all over the globe, his greatest passion is the sizzle of food on an open fire. Odeen’s BBQ started life very much as a purveyor in the Memphis style , popping up in the summer months to sell out to grateful crowds of summer festivals. For the first year all we sold was pulled pork, which was epic! As we honed the craft and learned the business we found ourselves being asked to cater larger and more complex events until we could no longer resist the call of the wedding market. We now consider ourselves seasoned wedding caterers and are blessed to have a great team behind us (especially our wives!) and some lifelong friends amongst our customers.